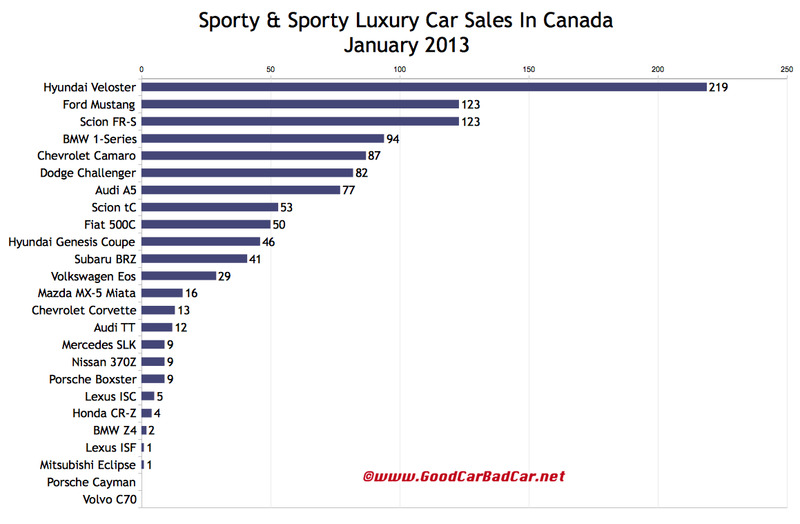 Canadian sales of rear-wheel-drive cars like the BMW Z4, Mercedes-Benz SLK, Chevrolet Camaro, Ford Mustang, Hyundai Genesis Coupe, and Nissan 370Z declined in January 2013. There were exceptions to the rear-drive failure rule, of course. The Porsche Boxster was up 200%, for example, but it only sold as often as the declining SLK. The Dodge Challenger was up 22%, but it still didn’t sell as often as the Mustang or Camaro. And while less costly cars like the aforementioned Hyundai and Nissan slid sharply, Porsche Canada sold 45 911s, up 150% year-over-year, and more than in any month since July. Shining a light on the 911’s situation, however, reveals the impact of a new generation of all-wheel-drive Carreras. 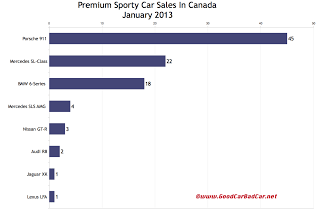 Porsche Canada has never before sold this many 911s in the first month of the year. Rear-wheel-drive cars weren’t the only ones to post year-over-year declines in January, not by any means. But in a market which shrunk 2.2%, it helps to provide an alternative. More relevant than the year-over-year comparisons is the simple fact that the purchase of a rear-wheel-drive sports car or muscle car, in the middle of a Canadian winter, isn’t common. In 2012, Ford sold eight times more Mustangs in May than in January; Mazda sold eight times more Miatas in July than in January; Nissan sold nearly eleven times more 370Zs in May than in January. 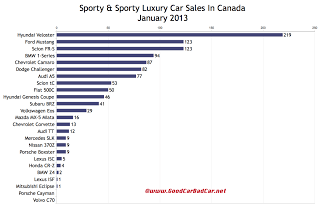 While the figures in the tables below remain relevant, they do not suggest a trend, a downward spiralling of sports car popularity or hot hatch success in Canada. One Canadian Subaru dealer I spoke to had multiple BRZs in stock in January but didn’t expect to sell any of them until spring. 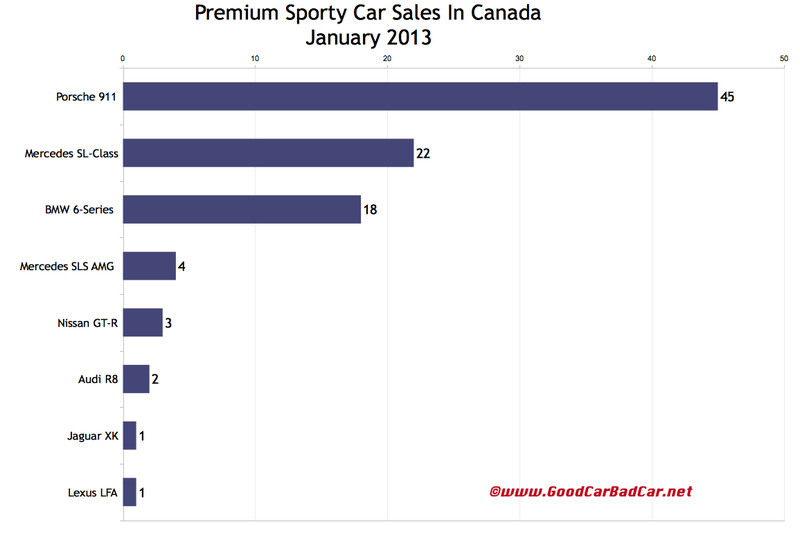 The fact that January was the second-lowest-volume BRZ Canadian sales month so far thus means little. The accompanying charts can be clicked for a larger view. Any model name can be clicked in order to find historical monthly and yearly sales figures. Or select a make and model at GCBC’s Sales Stats home. Best of all, the tables below are now sortable. Click any column header to rank vehicles by volume, year-over-year change, or re-sort alphabetically to return to the original.